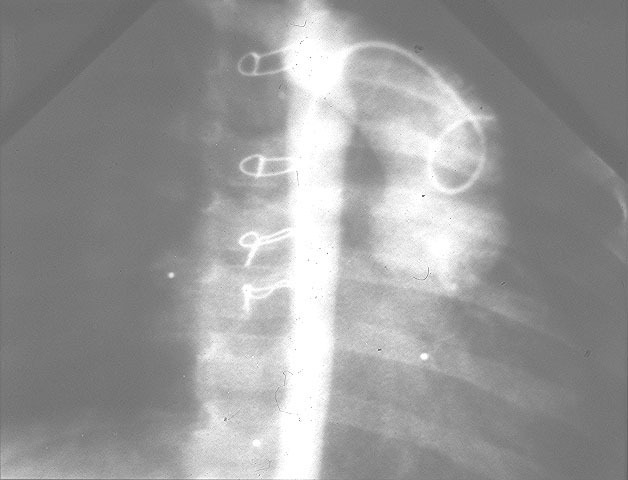 A. PA chest radiograph shows cardiomegaly with increased pulmonary vascular markings secondary to a ventricular septal defect. 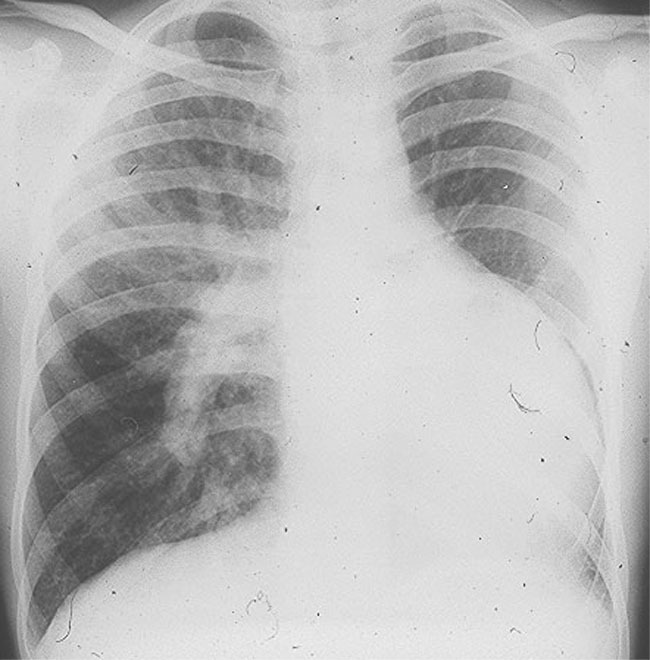 The right pulmonary artery appears to have a high take-off because of an absent aortic shadow and is also quite prominent indicating ventricular inversion, L-TGA. B. Postoperative aortic root injection shows levoposition of ascending aorta. C. Another example of corrected transposition with levoposition of ascending aorta. 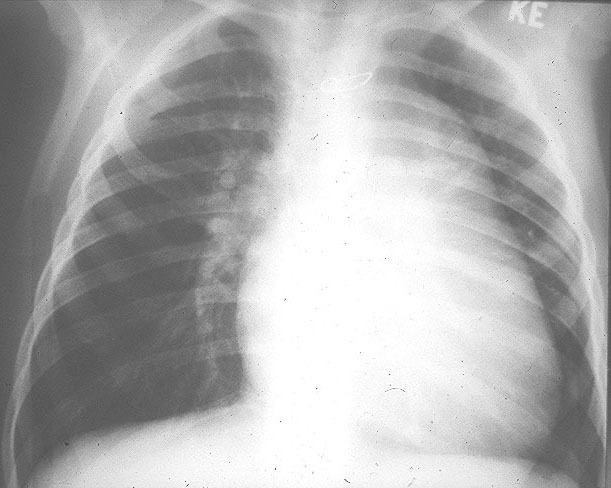 The prominence of the right hilum is due to the absence of the usual position of the ascending aorta. Congenitally corrected transposition of the great arteries also termed ventricular inversion/ L-TGA, is characterized by atrioventicular discordance and ventriculoarterial discordance, hence the left atrium connects to the right ventricle which connects to the aorta. Congenitally corrected transposition accounts for 0.5% of congenital heart defects. Embryology: Normally related cardiac connections arise from d-looping of the embryonic heart tube. L-looping of the embryonic tube results in the heart tube looping to the left while all other lateralization remains the same i.e. atrial situs solitus. Associated lesions: (1)Ventricular septal defect occurs in approximately 80% of lesions. This may be single or multiple. The majority of patients with ventricular septal defects have associated pulmonary stenosis(PS). (2) PS occurs in some 50% of patients and is usually subvalvular stenosis secondary to bulging of the malaligned ventricular septum. (3) Atrioventricular valve abnormalities occur in up to 90% of patients. This may represent Ebsteins anomaly with severe displacement of the tricuspid valve into the right ventricle or mild elongation or redundancy of the leaflets. Straddlingof the ventricular septum by either AV valve may also occur particularly in association with an inlet ventricular septal defect. (4) Conduction abnormalities including complete AV block occur in up to 30% of patients. First or second degree heart block in 20-30%. The prevalence of complete AV block increases with age. (5) Dextrocardia occurs in one quarter of patients with ventricular inversion/L-TGA. (6) Left superior vena cava to coronary sinus. CXR: Characteristically, in patients with ventricular inversion and transposition of the great arteries, the upper left heart border is straightened as a result of leftward displacement of the aorta. ECG: Typically, there is reversed septal depolarization with absent Q waves over the left chest in association with some degree of AV block.